Hey there, I’m sorry it’s taken me a while to write a post… I’ve been dealing with an ailing family member, followed by sudden bereavement. The matriarch, mother of mothers, my rock, my dearest grandmother is no more. May god bless her soul. While we deal with this difficult time of collective mourning as a family unit, I could not think of a better healing, warm reciepe that was more apt. While there are many versions of Rasam, here is one of them – a Tamil-style Rasam. The weather is also changing and autumn is now here, are you fighting a common cold, congestion or cough this autumn? Keep this recipe in mind. Start by soaking the tamarind in 400ml of warm water. Next, add cumin seeds, peppercorns and 1 spring of curry leaves to a pestle and mortar, grind to a coarse powder, to this add the peeled garlic and grind again until the garlic cloves break down to small pieces. Do not over grind, we only want it to be a coarse, crushed mixture and not a paste. Then use your fingers to squish the juices from the soaking tamarind, remove and discard the pulp/ fibre. Add in the tomatoes and crush them using your fingers along in the same tamarind, water mixture. Next, to a pot of medium high, add oil, once hot, add asafetida, mustard seeds, urad dal, pearl onions and curry leaves, saute till they lightly roast and release aroma. Add the cumin, pepper and garlic crushed mixture prepared earlier. Finally add in the red and green chillies. Saute on a low heat till the masala begins to crisp up. You should be able to hear the chillies, curry leaves crisp up and dry. Finally add the tomato and tamarind juice to the pot and season with salt, bring to a roaring boil. Allow to cook for 8-10mins and turn of the heat. Tip: Make sure you use rip tomatoes as its very difficult to crush/ squish unrip tomatoes with your bare fingers! So true. 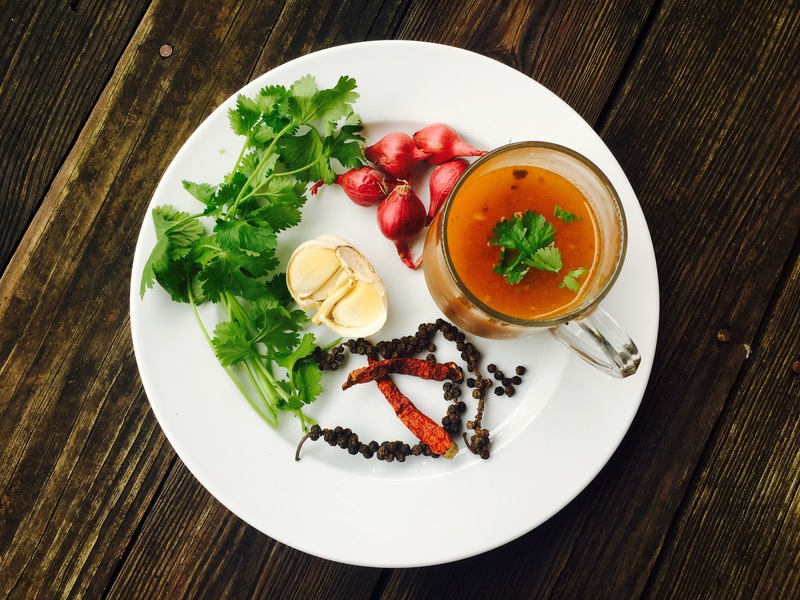 Rasam with milagu is paati vaithiyam to overcome cold on these winter months. Great write up! Reblogged this on Sivashankar Jagadeesan. Rasam is always comforting! It reminds me of my Paati’s food. Sending you lots of love and strength to get through this time. Thank you Sandhya for your kind and thoughtful words🙏 I appreciate it. This type of rasam is one my favourites too. Thank you🙏 I appreciate your comments. Please let me know how it turns out. Mouth-watering rasam, I prefer to drink this rasam than pouring over rice !! Thank you for your comments, great hearing from you. I prefer it as a drink too!